The Best Little Cinema in Britain? Hello, Channel 5 on UK television has a weekly movie program called ‘movielounge’ which airs Wednesday nights at 7-15. The show is running a feature called ‘The Best Little Cinema in Britain’ where viewers can nominate their favorite websites. To enter a submission, go to the movielounge website. We want to find ‘The Best little Cinema In Britain’ and we need your help! It doesn’t have to be a stunningly beautiful Grade One listed building – maybe you just love it because it’s NOT just another Multiplex, maybe it’s a bit old and tatty and strange but you saw your first film there or copped your first feel there – it doesn’t matter we want to hear from you. Let us know your thoughts and we’ll come armed with a camera crew to let you show off your favourite cinema to the nation. 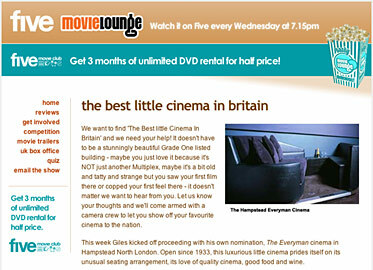 This week Giles kicked off proceeding with his own nomination, The Everyman cinema in Hampstead North London. Open since 1933, this luxurious little cinema prides itself on its unusual seating arrangement, its love of quality cinema, good food and wine.